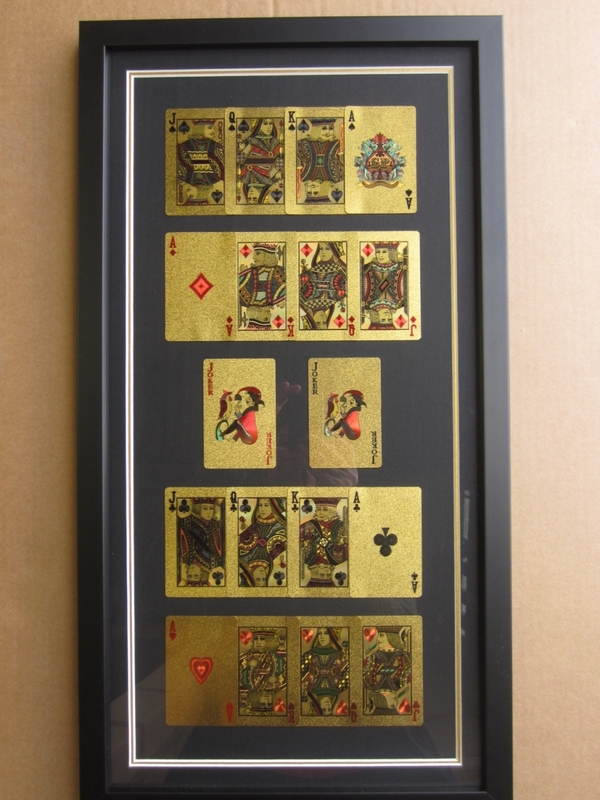 Gold plated Playing cards which we mounted and framed using 140 Black cube. 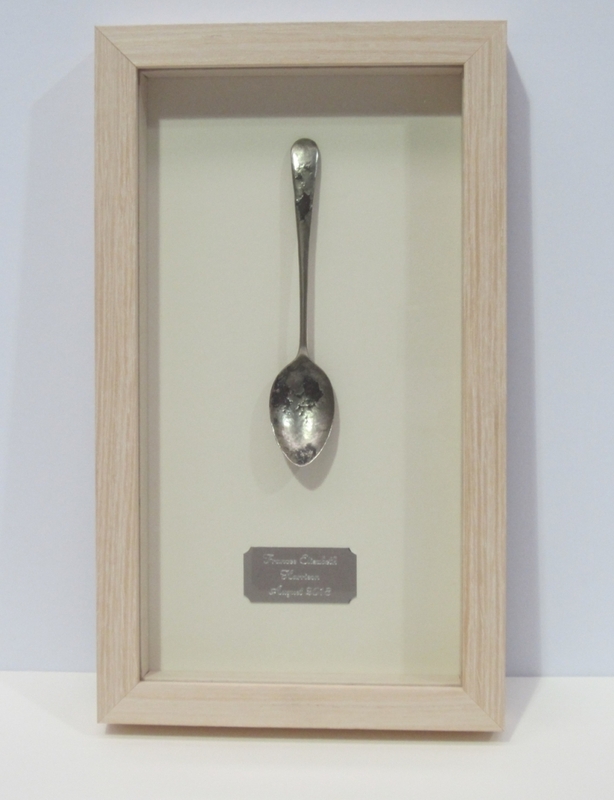 Christening spoon which we framed using a box frame with slip inside to hold keep the glass from touching the spoon, Acid free mount board was also used. 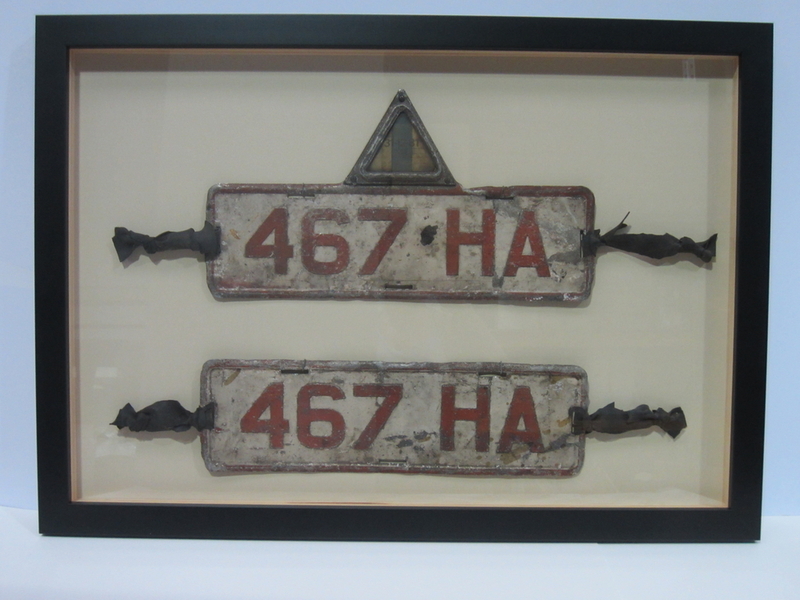 Some old number plates we were asked to frame, we used black wood 441 frame, added a box spacer to keep the glass from touching the plates, and used a cream backing board to fix the plates onto. 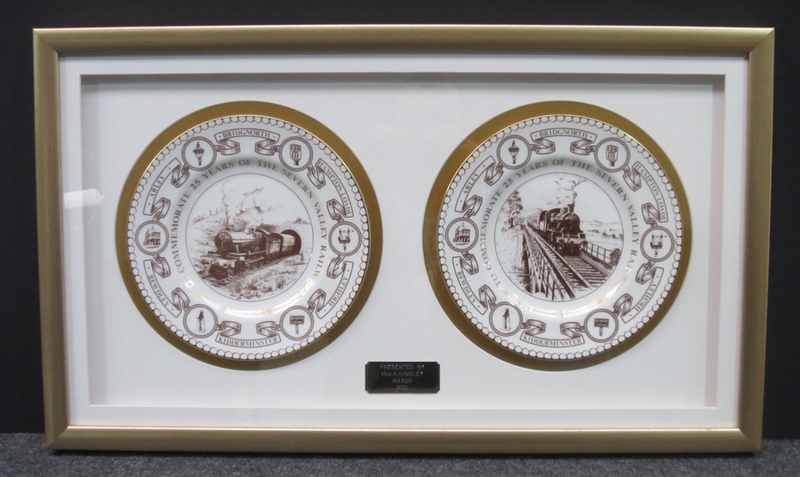 This is a pair of plates we were asked to frame to commemorate 25 years of the Severn Valley Railway. We used a deep Gold moulding, then fixed the plates onto gold mount backing board, included an acid free mount on top to make it a double, and added a mount to hide the box spacer in the frame. 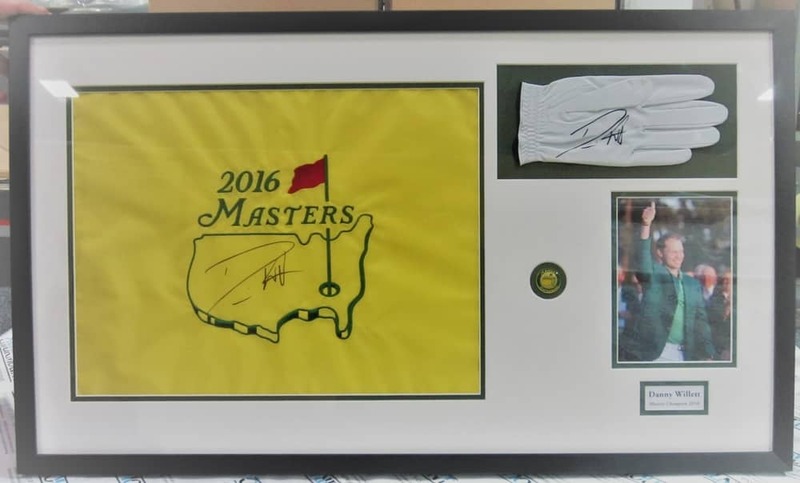 Here at Midland fine Arts we get asked to frame all manner of memorabilia, we were asked to frame this signed golf flag and glove. We cut an Acid free double mount and used a black wood moulding. Here is the finished result which looks really good. If you have any unusual or cherished items you would like framed then give us a call. We constantly Frame a wide variety of images, Artwork and Memorabilia. Here are a few examples of some of our work. You will find the moulding we used in our shop, we stock a huge variety of popular frame moulds and custom frames are available in almost any size. 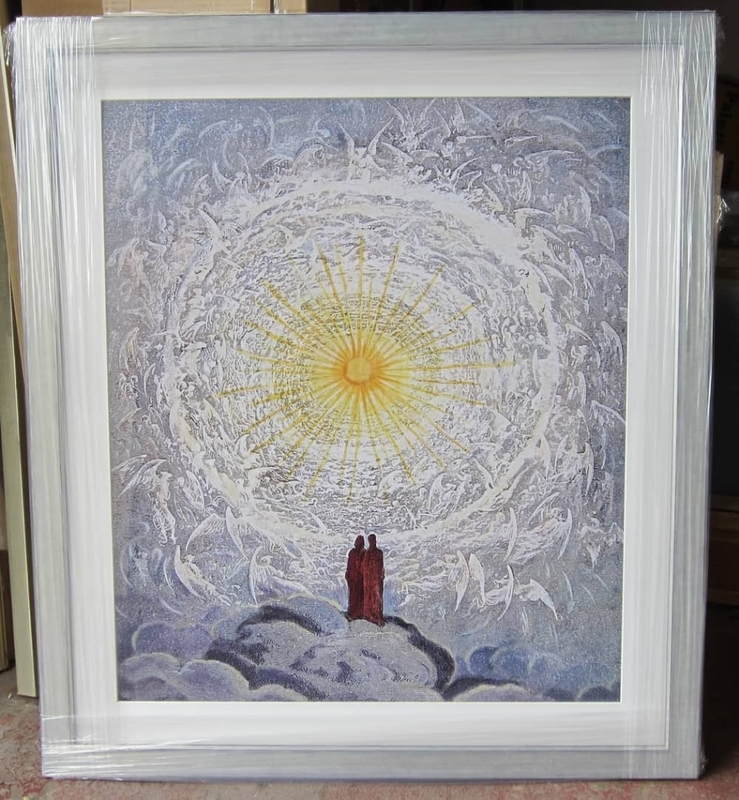 The frame moulding we used for this Artwork was Silver wood Picture frame 279, which can be found in our shop. 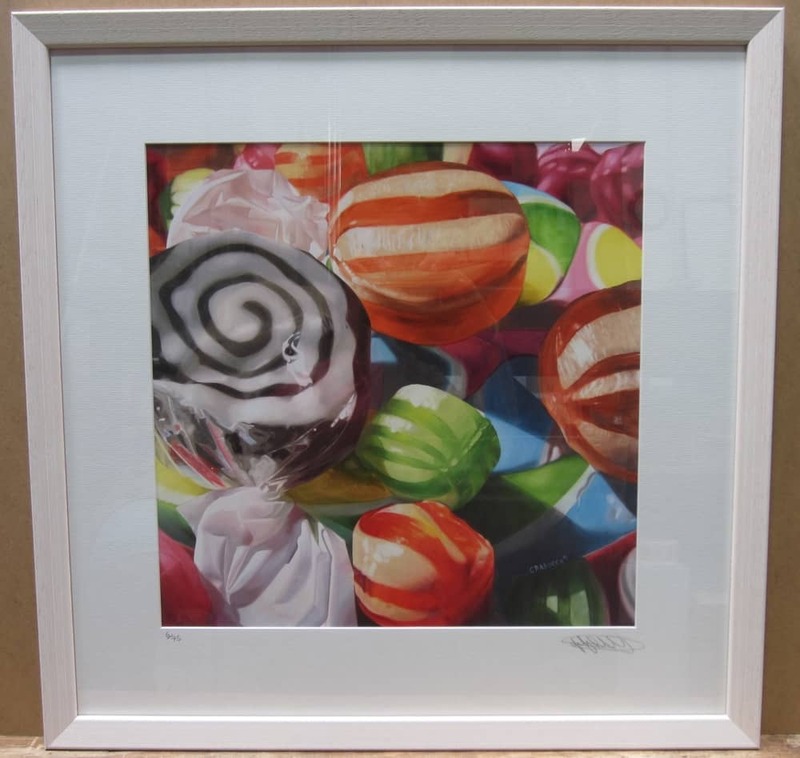 This Stunning picture was framed using a peach washed wood frame. We are often asked to frame limited edition images already mounted, but we can cut the mounts ready for signing if needed. Well here it is after many months of planning we have finally found the time to get our new website designed and launched. We have tried to feature all of the products and services we have to offer. If there are any framing related services that you are interested in and we have not mentioned yet do please give us a call and we will always try and help. Midland Fine Framing is part of Midland Fine Art and is the new name for the ever increasing framing parts of our business. Thank you for taking a moment to look through our new site we look forward to helping you with all you framing requirements in the very near future.